Gingersnap Cookies – Making Them Is a Snap! 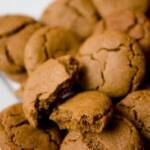 Gingersnap cookies make a simple morning/afternoon/evening/3AM treat. Gingersnap cookies also are fabulous crushed. Stir the mixture to blend evenly, and sift a second time into another bowl. Place the shortening/butter into a mixing bowl and beat until creamy. Gradually beat in the white sugar. Beat in the egg and dark molasses. Pinch off small amounts of dough and roll into 1 inch diameter balls (or any size that you like) between your hands. Roll each ball in cinnamon sugar (if you dig that), and place 2 inches apart on an ungreased baking sheet. Cool cookies on a wire rack. Store in an airtight container.